During the reign of the Emperor Napoleon III (the nephew of Napoleon), Paris was expanding to both the east and the west, and as the only public parks were situated in the centre of Paris, the Emperor decided to build two new large public parks. In the east he would create the Bois de Vincennes and in the west the Bois de Boulogne. The Bois de Boulogne [bwa.d(ə).bu.lɔɲ] covers 845 hectares (2090 acres) and sits within the 16th arrondissement of Paris. It was originally part of the ancient Forêt de Rouvray (Forest of Rouvray) which stretched from the western edge of Paris all the way into Normandy. The park was created between 1852 and 1858. The emperor had spent some time in exile in London, was impressed by Hyde Park and wanted to create something similar in Paris. He was personally involved in the planning and insisted that the Bois de Boulogne should have a lake in the style of the Serpentine in London's Hyde Park. This plan almost went wrong when the original design failed to take into account the difference in elevation between the two ends of the lake. If you visit the park today you will notice the two lakes 'Lac Superieur' and 'Lac Inferieur' have a cascade in between them which was created to solve the problem. The park has also been the subject of works of art by Manet, Renoir and Van Gogh. Moving into the present day, the bulk of the park is still forest with paths, allees and avenues that criss-cross their way through the park. There are also various gardens, a complex of greenhouses which contain 100,000 plants, a zoo, an amusement park and boats available for hire on Lac Inferieur - we spent a day exploring the park and hired a 'Canot' (little boat) and enjoyed a good hour on the lake. The park has strong links to horse racing and features two horse racing tracks on its borders. The French Open (tennis) is hosted at the Stade Roland Garros complex which is situated at the southern end of the park. 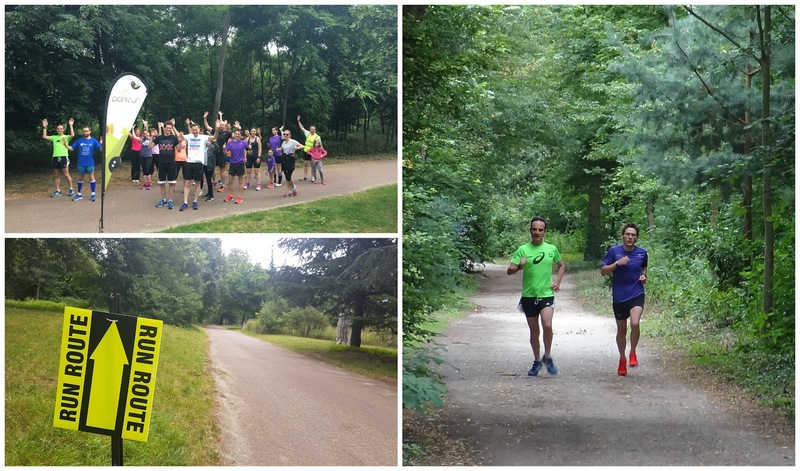 Putting everything else to the side for now, we were here for the park's newest sports-related event and that is the parkrun du Bois de Boulogne, which is a free, timed, 5 kilometre, run which is open to all abilities every Saturday morning at 9am. 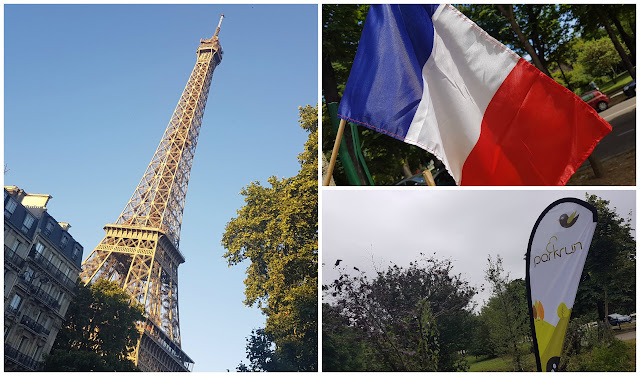 We had travelled to Paris a few days earlier and were staying in a flat just outside the park in La Muette; it's not the closest point to the start of the run, but it was close enough to travel there on foot. The meeting point for the run is in the south eastern corner of the park at a crossroads in the path which is right next to a car park. If you're looking on a map you will see the road 'Route de Boulogne a Passy' which leads into the car park from the south. Then there is a footpath called 'Route d'Auteuil Suresnes' The point where these two meet is where the runners meet - the pre-run briefing also takes place here. 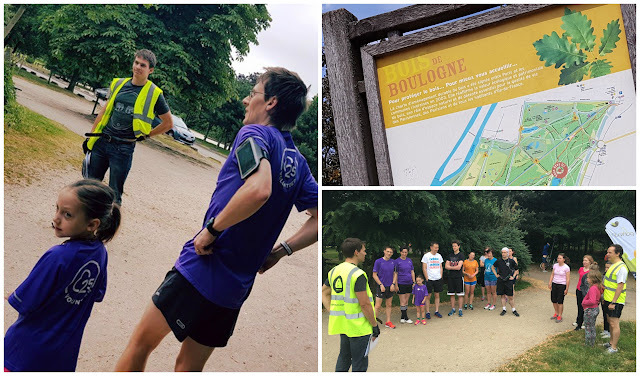 This parkrun currently seems to attract a high percentage of British parkrun tourists and the run briefing, while being predominantly in French also had the most important parts also relayed in English. We approached from the north of the meeting point via the entrance closest to La Muette and we (I) got a little confused on the way and arrived at the start with very little time to spare. The easiest way to find the start would be by travelling to the Porte d'Auteuil station on the Metro (served by lines 9 and 10), exiting via the 'Hippodrome' exit and entering the park at the southern end. If driving then you can head for the car park right next to the meeting point (I didn't check to see of you had to pay for this). The start of the run is about 50 metres south of the meeting/briefing point and the runners head south from this point. 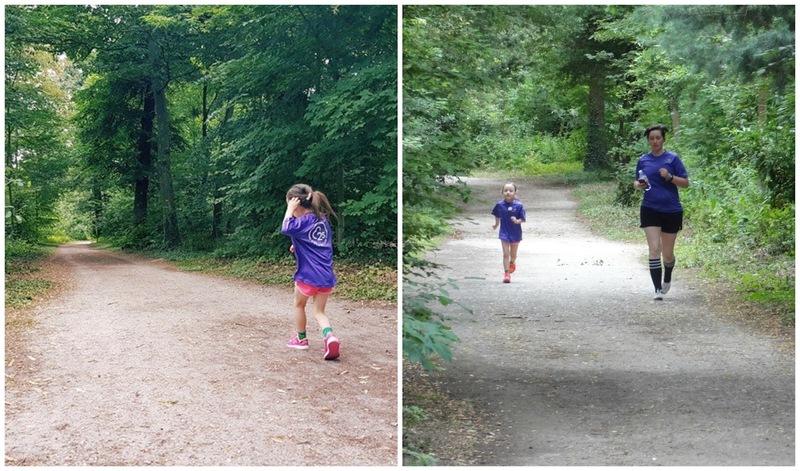 Underfoot is a mixture of tarmac and dusty forest trails - we ran here in the summer and it was dry but I could imagine certain sections being wet and splashy during the winter. 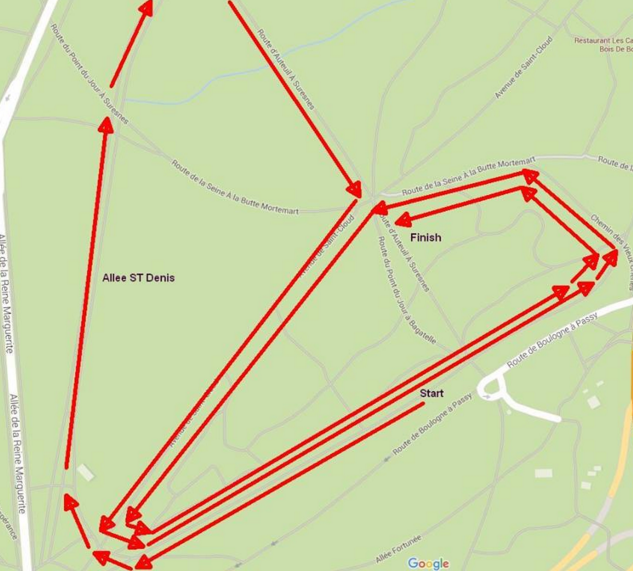 The shape of this course makes it quite difficult to categorise and depending on who you ask, you'll get a slightly different way of describing it (figure of eight / three laps / heart shaped etc..). I have attached a diagram which I found on the venue's official Facebook page and I think this shows the route better than I can explain. However, I will try. The first section is slightly downhill and is run on a smooth tarmac path. At the end of the path, the course swings to the right and then right again onto 'Allee Saint-Denis' (there are a few different paths at this point of the park so pay attention to the marshal and look for the arrows). Underfoot now changes to the dusty, slightly uneven forest paths. At around 1km into the run there is a cycle path to cross so it's worth looking boths ways just to be sure the way is clear. A marshal at a sharp right-hand turn shortly after directs the runners onto ''Route d'Auteuil Suresnes' which leads towards the wide 'Avenue de Saint-Cloud'. 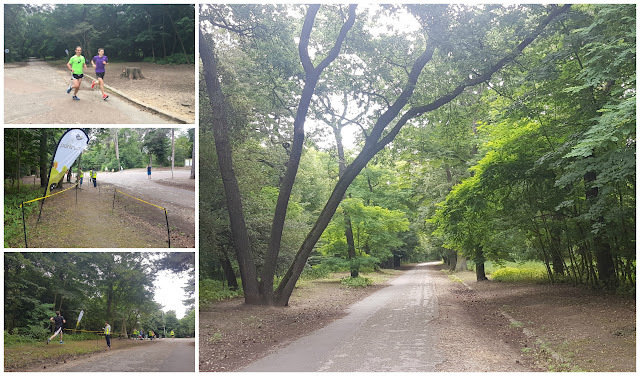 Once reaching the junction with 'Avenue de Saint-Cloud', the runners have completed a 'C' shaped loop of the left/upper part of the course in a clockwise direction and must now complete two full anti-clockwise loops of the right/lower section which is essentially all on tarmac. This loop starts at the junction where the runners emerge from the forest path and sees the runners following the avenue towards the southern end of the course where they turn left and head back up along the opening section, pass the start line and meeting area, then follow the arrows back around to Avenue de Saint-Cloud where they continue to repeat this loop a second time. At the end of the second anti-clockwise loop the runners enter the finish funnel which is located at the aforementioned junction. Conveniently there is a Wallace Fountain right next to the finish line - these fountains provide free drinking water across the whole of Paris [link: map] so it's a great spot to re-hydrate post-run or to refill a water bottle if you have brought one along. 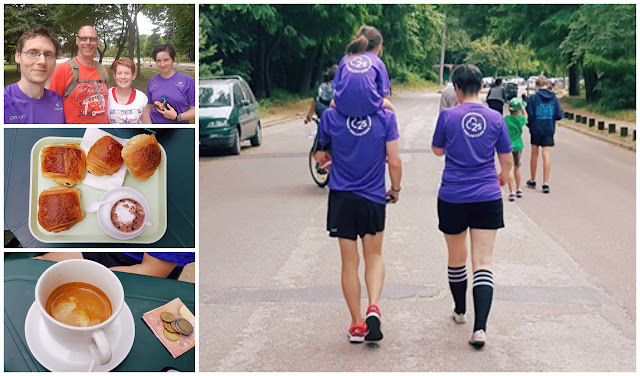 Barcode scanning takes place right at the finish and once all of the runners have finished, they pack up and head north along the avenue to 'Le Café du Bois - Chalet de La Pelouse St Cloud' for a coffee, croissant and a post-run chat to the team and some fellow tourists. The results for event 25 were processed a few hours later and we are pleased to now be able to call ourselves not only 'international parkrunners', but also 'parkrunneurs'. However, with the strict French rules around what constitutes a 'race' you will not find course records, age category records or a points table published here. Also you'll find everyone's finishing times listed in alphabetical order rather than by finishing position/time which re-enforces the fact that this is a run and not a race - I wonder if this will eventually happen to the UK results pages. 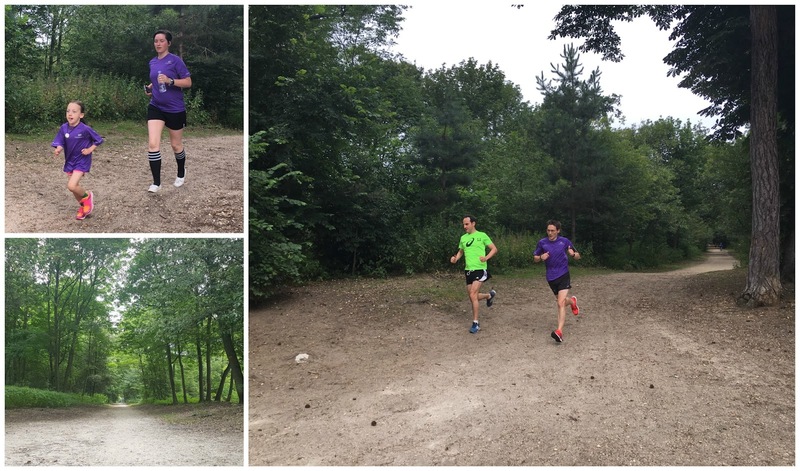 If you'd like to see the course in detail, my full GPS trace for the course can be found on Strava, here; parkrun du Bois de Boulogne.